It’s the time of year when most people want nothing more than to get cozy and hide away from the winter cold. If that sounds like what you’re looking for but you don’t have the time, money, or patience to do a full-on Martha Stewart-inspired do-it-yourself holiday, look no further. There’s nothing I’m better at than making quick crafts and goodies. You can spend more time enjoying them and less time stressing out over how to make the things you need to relax. The following how-to is for anyone who wants to enjoy the winter break on a student’s budget and a student’s schedule. Everyone makes a big deal out of Egg-Nog during the winter seasons. It’s everywhere: in movies, cafes, holiday parties, and possibly even in your fridge right now. I’m going to introduce you to something a little spicier and less eggy. 1) Go to your nearest IKEA. 2) Find yourself the “Mulled Fruit Juice” bottle, which costs around $4.00 and saves you a lot of time mulling different spices, juices, and fruits together. 3) Purchase some Merlot from your nearest liquor store (for those who don’t know, Merlot is a red wine). The price of the bottle makes no difference. The point is to save money. 4) Take your ingredients home and put them in a small pot on the stove. If you’re aiming to make a cup of mulled wine, split it down the middle. Half of the liquid in the pot should be the fruit juice, with the remainder being the Merlot. Try not to boil it, you just want to heat it up on the stove top. 5) There you have it—a mulled wine beverage to help you get through your last essays and warm you up at the same time. This one takes a bit more preparation, but for all of us who have looked at Pinterest, seen beautiful homemade candles, and said, “Maybe one day,” it’s worth it. Today can be that day. 1) Gather the basics for your candle. 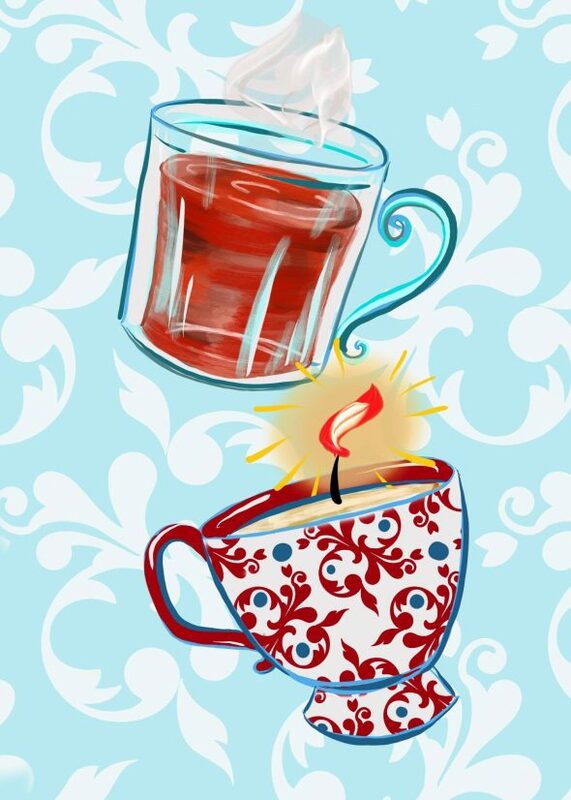 You’ll need something for the candle to go into—personally, I like picking up a vintage-looking teacup from a thrift shop, since they are often very inexpensive. You will also need a wick, which you can get a small pack of at your local craft shop, like Michaels. Don’t buy the candle wax from Michaels, just go to a dollar store, buy some tall candles, and chop those up into small pieces to melt. If you want to be really cost-efficient, use the wick from the candles you chop up! 2) Pick your scents. If you want a scented candle, the best way to do it is to use essential oils, which you can also pick up at Michaels. Anything else will just give you a headache. If you do use oils, go with festive scents like gingerbread, vanilla, cinnamon, or student’s tears. 3) Take all of these goodies home and get cracking. Boil water in a pot and then remove it from the burner. Boil just enough water so that when you put a glass bowl in it—the size of which should depend on the size of your tea cup—the water doesn’t spill over into the bowl. Put the aforementioned bowl into the hot water and then put in the wax, moving it around to melt it. Once it’s melted, get your teacup and the wick. 4) Hold the wick with tongs so you don’t burn yourself and keep it still in the middle of the cup with the end gently touching the cup’s base. Pour the wax in to the brim. Try and keep the wick straight. If you want to add any essential oils, do so while the wax is still soft. You may need to stand there for a few minutes to hold the wick. Otherwise, the wax will swallow it up. 5) Once the wax is stiff, you can let go and use your own little homemade candle. You’re welcome, and happy creating. Please don’t burn your house down.